The Move Seattle Levy proposed by Mayor Murray provides limited Safe Routes features at every Seattle school. We want to make sure these safety dollars for all schools are kept in the Levy. 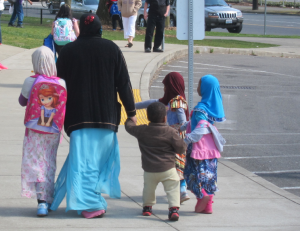 Our Move Seattle For Our Kids proposal seeks to add more traffic safety improvements throughout School Walk Zones in elementary schools where 50% or more students receive free or reduced cost lunch. Depending on the location of the school, extra improvements might include a package of stop signs, crosswalks, stairways, sidewalks, speed bumps, Rectangular Rapid Flashing Beacons, traffic signals, and other intersection and road improvements. How much will all of this cost? $38.41 million. Click here to see the details. 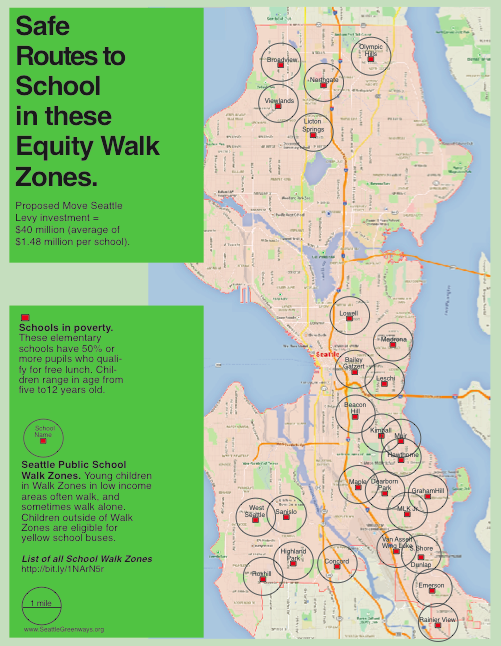 It would be fabulous if the Move Seattle Levy could make significant investments like these in all our schools, but let’s improve the school walk experience for our most vulnerable children first. Don’t get me wrong, we need the $900 million Move Seattle Levy to repave our crumbling streets and stairways, seismically retrofit bridges, re-stripe intersections, replace traffic signals (some more than 50 years old! ), and replace stop signs that have faded to a pleasant but ineffective pink. Seattle Neighborhood Greenways staff and volunteers are advocating strongly on your behalf to ensure these Levy-funded maintenance projects include robust safety improvements such as better signal timing, protected bike lanes, curb extensions, speed tables, and 20 mph street engineering. We’re collaborating with Cascade Bicycle Club to make sure this Levy builds half of the Bicycle Master Plan. We’re thrilled the Levy includes money to build Complete Streets, support thriving business districts, and calm high-speed arterials. Here is a map of where we’d like to see Move Seattle For Out Kids. Why Are We Proposing Move Seattle For Our Kids? Exciting as the Move Seattle Levy is, what gets me out of bed eager to work in the morning is speaking up for more safety for our kids. Why is this? It might have been the young girl walking to school along a busy Beacon Hill street with no sidewalk because a dumpster had blocked her gravel walking path. Or maybe it was the brothers, no more than six and nine years old, peering carefully around a parked SUV as they prepared to cross the four lanes of South Henderson Street in Rainier Beach. Or the mom with a baby in a stroller, a toddler hanging on, and a young school girl waiting patiently on a West Seattle corner as driver after driver after driver zipped past without stopping. Or the little boy crying as he walked home by himself, along a narrow weed-choked path on Renton Ave S.
I’m a huge supporter of kids walking to school. Children benefit academically, emotionally, and physically when they get a daily dose of fresh air and exercise. Unfortunately, the trip to school has changed and a significant majority of parents now drive their children to school. In 1969 89% of K-8 children who lived within one mile of school walked or biked. In 2009 that number dropped to 35%. Personally, I loved the daily walk to elementary and middle school with my son in Wallingford. We talked, enjoyed the seasons, and explored the neighborhood together. Many of the children who walk to school now live in places where the walk to school lacks basic safety improvements. Children walk because their families cannot afford a car and lack the time and resources to drive their children to school. Instead of a pleasant walk to school, families walk because they must walk. Let’s make those walks safe choices. Every school in Seattle has an officially sanctioned Walk Zone. You can find your own neighborhood school in this list. Children who live within their Walk Zone (about 1 mile for elementary kids and 2 miles for high school) are expected to get to school on their own. Outside of the Walk Zone, Seattle Public Schools provides yellow bus service for younger children, and Orca cards for high schoolers. Support A Transportation Levy To Move Seattle For Our Kids!